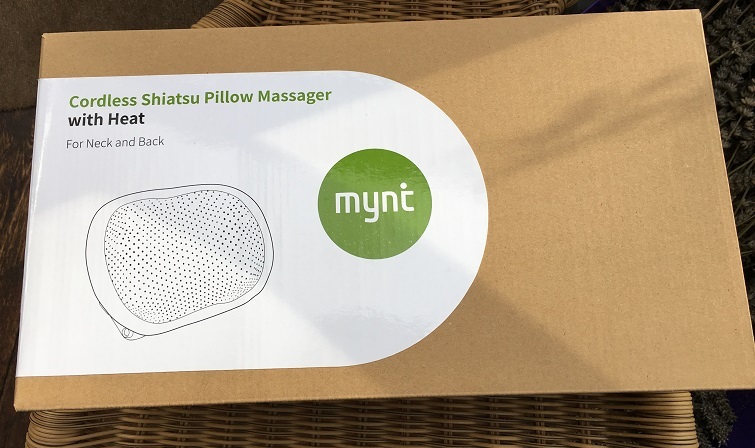 Today I have received a Mynt Cordless Pillow Massager to review, and there is a link at the bottom to a giveaway where you can win 1 of 200 massagers. Nice simple packaging, as with all things that come from Mynt’s parent company, Anker, and a nice simple box to wrap for people. It comes with an easy to follow user manual in English, Spanish, German, French and Italian, but really all you have to do is connect the adapter and plug it in to charge it. Then when it is charged you can either use it cordless or plugged in. As I’m sitting here writing this, the Mynt massager is sitting right behind me, nestled in my office chair, giving my lower back and buttocks a really good kneading. It feels quite firm but in a really good way, and I’ve also got the heat setting on as my office is a little chilly. I don’t know enough about Shiatsu to know whether this automatic action is anything like real Shiatsu or whether it is having any real therapeutic effect, but I do know that it feels really good and brings a smile to my face. The mixture of the kneading and the gentle heat makes me think of being in a spa, getting myself pampered. If I just added some essential oil scents and some floaty music, I would be there, even though I am actually at my desk working. My daughter tried it too – she is studying for GCSEs with mocks in a few weeks, so her shoulders are knotted tight with stress. So she tried it there, sitting back in our armchair, and after getting used to the tickling sensation and relaxing into it a bit, I soon saw the biggest grin from her that I’ve seen in a long time. I think I’m going to have to fight her for this device…. So if you want to get your hands on one of these handy massagers then fill in the Gleam widget below. Feeling happy and proud to say that this is my favorite Blog. The postings are very unique and also outstanding performance with the new creativity and Excellency with the new different ideas and concepts. Really I am waiting for some more new posts from you. Keep up your Excellency and efficiency in these same levels.